Part of the audience engagement process in multimedia performance is the integral dynamic of conflict and resolution between forms. Take one of them away and you have a different sensory experience. So, having witnessed graphic artist Danijel Zezelj and Darcy James Argue create separate but integrated works of art in the live performance of Brooklyn Babylon, it's challenging to antedate expectations around what may seem to be one part of an equation. However, Argue's release of the suite from Brooklyn Babylon does more than stand upit is an astonishing, living and breathing creation; as sprawling and vibrant as the sweeping canvas of Zezelj's monolithic Brooklyn Bridge and wrecking ball, beautifully reproduced for the CD's cover. 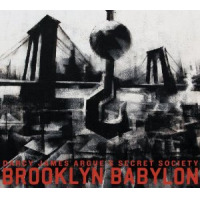 The scope of Brooklyn Babylon is expansive and insightful. Classically bookended with its "Prologue" and "Epilogue," Argue's compositions incorporate pastoral Americana, European influences and measures of avant-garde. 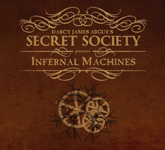 As an extended form, this suite differs from Secret Society's much heralded debut Infernal Machines (New Amsterdam, 2009) where solo performances are more insistent compared to the Impressionistic and billowing backdrop of the main themes. Brooklyn Babylon is cinematic in its slow and understated setting of scenes giving way to highly expressive improvisations and then regrouping. Erica von Kleist's piccolo, Josh Sinton's baritone sax and Sebastian Noelle's electric guitar impart vocal qualities to their instruments when the Secret Society expresses powerful human emotions as in "The Tallest Tower in the World." Architectural and social engineering come together in "Construction + Destruction" reflecting the broader implications of progress through the dark veil of a daunting Gotham infrastructure. The collateral damage can be felt eloquently in Ingrid Jensen's haunting trumpet on "Builders" even while the adjacent melody never gives up enthusiasm for moving forward and apprehension of the unknown. The melting pot of Brooklyn figures prominently through Latin, Middle-Eastern and Eastern European flavors. Those subtly devised inspirations are most notable in pieces like "Prologue," "Missing Parts" and "Interlude No. 3. Enthrall" with its Central Asian influences. Arguelike Maria Schneideris among a small handful of exceptional composers who have taken ensemble music far beyond a vestige of a bygone era. 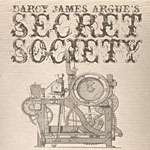 He deals in complicated themes not easily made musically palatable but Argue and the Secret Society take them to a level that is completely engrossing. With its humanity, complexity and transformational beauty, Argue has created a timeless modern masterpiece with Brooklyn Babylon. Personnel: Erica von Kleist: piccolo, flute, alto flute, soprano sax, alto sax, electronics; Rob Wilkerson: flute, clarinet, soprano sax, alto sax; Sam Sadigursky: clarinet, tenor sax; John Ellis: clarinet, bass clarinet, tenor sax; Josh Sinton: clarinet, bass clarinet, contrabass clarinet, baritone saxophone; Seneca Black: trumpet, fluegelhorn; Tom Goehring: trumpet, fluegelhorn; Matt Holman: trumpet, fluegelhorn; Nadje Noordhuis: trumpet, fluegelhorn; Ingrid Jensen: trumpet, fluegelhorn, electronics; Mike Fahie: euphonium, trombone; Ryan Keberle: trombone; James Hirschfeld: trombone, tuba; Jennifer Wharton: bass trombone, tuba; Sebastian Noelle: acoustic & electric guitar; Gordon Webster: acoustic & electric piano, melodica: Matt Clohesy: contrabass & electric bass; Jon Wikan: drum set, tapan, surdo, cajón, shaker, tambourine, misc. 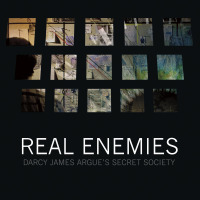 percussion; Darcy James Argue: composer, conductor.